Dances are held the first and third Fridays of each month in the West-Mackenzie Hall at the Aurora Seniors Centre from 8:00 pm to 11:00 pm. The exceptions are in July and August when no dances are held. 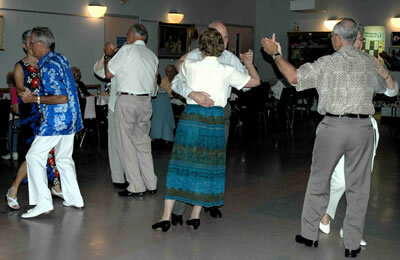 Dances feature a wide range of recorded music from the volunteer DJ’s – waltz, jive, quick-step, foxtrot, cha-cha, samba. We also have line-dances with everyone joining in, some with skill, others learning the steps. Non-members and singles are always welcome. There is a small charge but we include snacks. Also, at 9:30 pm, we serve a buffet of sandwiches, dessert and tea/coffee. Wine, beer and soft drinks are available at our Cash Bar.